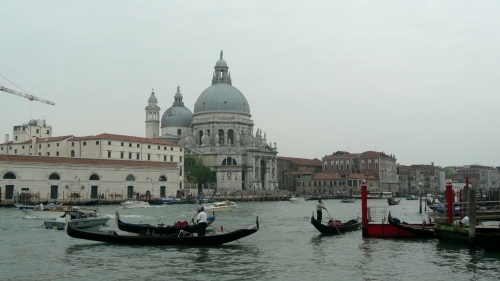 Getting to Venice from Paris was pretty much a full day’s travel. 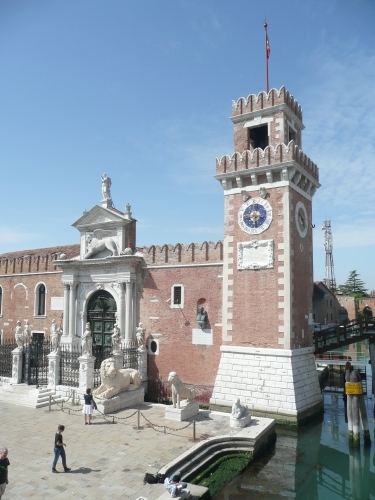 As usual, we went by train, first to Basel in Switzerland, where I paid for a couple of coffees with a €10 note and got two 2 Swiss franc coins in return, then to Milan and finally to Venice Mestre. This latter station is on the mainland, where as the iconic old city is on an island (actually, it effectively is an island) just off the coast. We checked in to a cheap hostel (which called itself a hotel) near the station, witnessing a beautiful sunset display of light and shade in the sky, chatted to an interesting and talkative New Zealander, Edward, who was sharing our four-bed dormitory, and caught a train (along the lengthy bridge that connects Venice to the rest of the country) to Santa Lucia station to have a look round Venice at night. 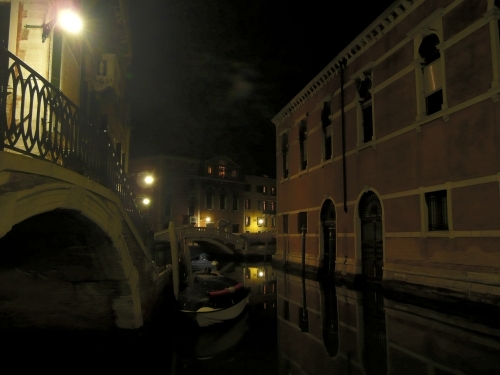 We didn’t go far within the city and the dark, narrow alleyways were pretty quiet – a little eerie, even. The area next to the station was busier, though, with plenty of tourists and vendors – there various people selling the little balls that go splat on a surface then resume their shape and the helicoptery things that you catapult into the air. The following day, we had made plans to look around Venice with Edward, but there was little sign of him when we went to breakfast – at a different hotel. Habiba saw him out of the window, but then he didn’t materialise. I went back to our hostel to look for him, but he wasn’t there. 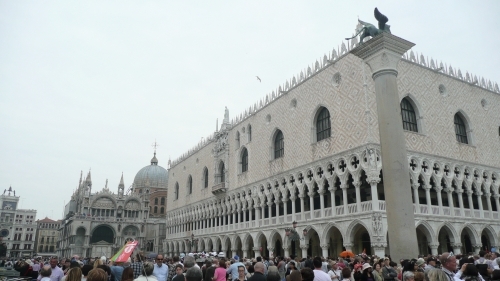 We took a crowded bus into Venice and then a waterbus along the Grand Canal to Piazza San Marco. 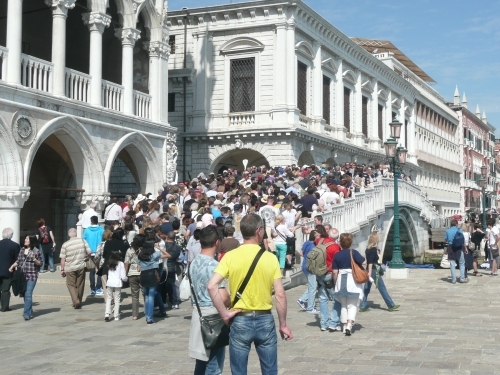 We decided to go into St Mark’s Basilica and joined a queue. Unfortunately, after half an hour of shuffling along, it became apparent that we wer in the wrong line; we stepped across to the correct one. As we approached the entrance to the basilica, a French-sounding woman approached us (and apparently only us) and told us that packpacks weren’t allowed inside and that I would have to check mine in to a nearby cloakroom. I went to check this intelligence out and passed Edward coming out of the basilica. He explained that he’d come to the breakfast hotel that morning but hadn’t been allowed into the dining room because he didn’t want to have any breakfast. Edward looked after my bag while we went inside. The inside was a spectacle of gold. 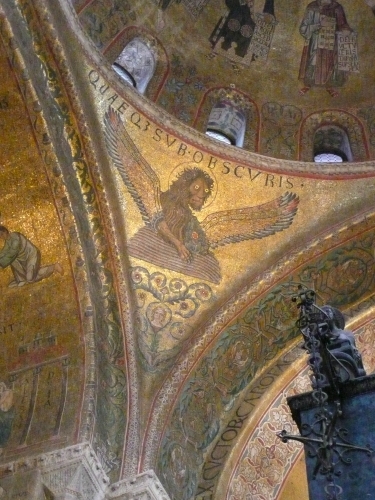 Pretty much every bit of the ceiling was covered in mosaics with gold backgrounds. The floor tiling was interesting – circles and shapes that suggested 3D steps. One particular mosaic stood out: a lion with mad, anguished staring golden eyes. We hooked up with Edward outside and started wandering around. We went back to the water and turned left past the Ducal Palace, passing over a crowded bridge that gave a good view of the Bridge of Sighs; when we came back the same way later the bridge was jam packed with tourists and tour groups all trying to get a glimpse of the famous bridge along which prisoners passed on their way to the cells. We walked towards the castle walls and found them to be closed (it being Monday). We had lunch together – Habiba and Edward had surprisingly good value pizzas; I had a tasty but not so filling ravioli dish. 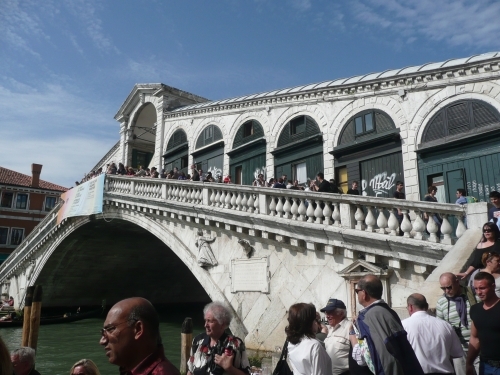 We headed to the Rialto Bridge and parted ways with Edward. Habiba bought some excessively juicy fruit that contained a ball of pips in their centres; I found them rather annoying to eat. Before we left, we headed to a souvenir shop that I’d seen the previous night and I bought myself a little aquamarine glass cat for €3. The bus back to the mainland was less crowded, but still fairly busy. Bright and early the next morning we said farewell to Venice and took the train to Rome.